Chris Tracz was an exceptional athlete at North Branford High School, earning varsity letters in the 2 sports that he played for all 4 years. Chris served as the captain during both his junior and senior years in both basketball and baseball. In addition to being a top scorer in basketball, Chris was also able to demonstrate all basic skills to be a complete player. He was recognized as a New Haven Tap-Off Club All-County player as well as an All-State player, and still holds the record for career points with 1,872. As a baseball player Chris was also an All-Conference, All-State player for multiple years. He was a dominant pitcher for the T-Birds and pitched a “no hitter” against Valley Regional while registering 15 strikeouts. His overall career record at NBHS was 24 wins and 5 losses. He was the New Haven Register Male Athlete of the year in both sports but chose to continue his baseball career at Marist College where also had an outstanding collegiate career. 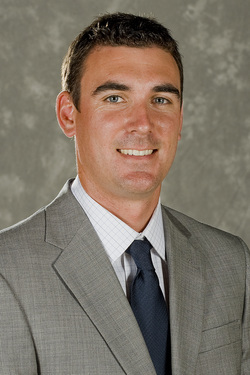 In 2010 Chris was appointed as the Marist Head Coach for baseball. The North Branford High School Athletic Hall of Fame is proud and pleased to induct Chris Tracz on July 10, 2011.